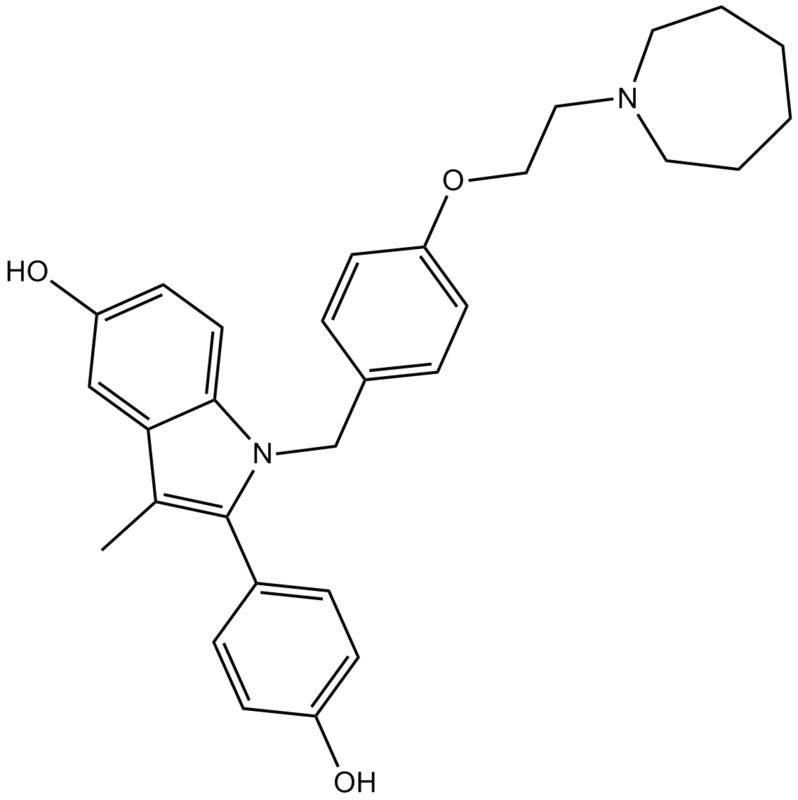 Description Bazedoxifene is a third generation selective modulator of estrogen receptor. Bazedoxifene is a selective estrogen receptor modulator (SERM) with IC50 value of 26 and 99 nM for estrogen receptorα and β, respectively . Bazedoxifene is a SERM used for the prevention and treatment of post menopausalo steoporosis which is caused by the loss of endogenous levels of estrogens. It is developed as a third-generation SERM which can reduce the vertebral and nonvertebral fracture risk and have no stimulatory effects on breast or uterus. Bazedoxifene is an estrogen receptor ligand with an indole-based core binding domain. It binds to both ERα (IC50 value of 23nM) and ERβ (IC50 value of 85nM), exhibited agonist activity in bone, cardiovascular system and CNS while exhibited antagonist activity in breast and endometrium. It competitively inhibited the binding of 17β-estradiol to both ERα and ERβ [1, 2 and 3]. In MCF7 cells, treatment of bazedoxifene showed no ER agonist activity and no effect on the cell proliferation. However, it suppressed the 17β-estradiol -induced transcriptional activation and cell proliferation . In ovariectomized rats, administration of bazedoxifene at dose of 0.3 or 3.0 mg /kg daily for 6 weeks resulted in the protection of skeleton from bone loss with increased bone mineraldensity. In addition, the compression strength of the fifth lumbar vertebra was significantly improved by bazedoxifene. Moreover, administration of bazedoxifene at dose of3.0 mg /kg/day showed modest stimulatory effects on rat uterine with small increase in wet uterine weight. Bazedoxifene also had no ER agonist effects on rat vasomotor activity [2 and 3]. de Villiers TJ. Bazedoxifene: a novel selective estrogen receptor modulator for postmenopausal osteoporosis. Climacteric. 2010 Jun;13(3):210-8. Duggan ST, McKeage K. Bazedoxifene: a review of its use in the treatment of postmenopausal osteoporosis. Drugs. 2011 Nov 12;71(16):2193-212. Kawate H, Takayanagi R. Efficacy and safety of bazedoxifene for postmenopausal osteoporosis. Clin Interv Aging. 2011;6:151-60.